Investing in stocks is usually associated with shares like AAPL, GOOGL, AMZN and other companies from similar caliber. But the truth is that, in order to make money, one should not rely only on blue chips. In fact, penny stocks reveal a whole new world of investment opportunities. In the next few lines, you will find out about one of the not-so-popular, yet highly potential parts of the stock market – the world of penny stocks. Where to ​Day Trade Penny Stocks? 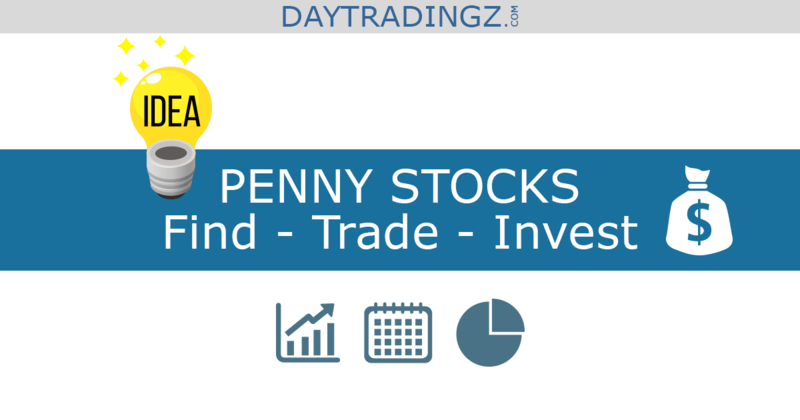 How to find Penny Stocks worth day trading? According to the SEC, penny stocks are shares of small companies that are traded at prices of less than $5. This type of shares is usually traded OTC (Over-the-Counter) but they can be found at some exchanges as well. Penny stocks are issued by companies with a very small market capitalization like local or early-stage businesses, for example. In general, penny stocks are one of those high-risk/high-reward instruments. That is why your first step should be to find out whether this type of shares is a suitable choice for achieving your investment goals. The truth is that they can help a beginner investor with small capital to grow the value of his portfolio quickly. Yet, due to the high risk, associated with penny stocks trading, they have the power to wipe out all your investments as well. Day trading is associated with a more dynamic trading activity, built around the idea of making multiple trades per day. When it comes to penny stocks, day trading for beginners can be quite challenging. And not any day trading strategy ​should be used for day trading penny stocks. The reason is that the OTC market for those types of shares usually lacks liquidity. This means that if you rely on taking advantage of price fluctuations and capitalizing on the market momentum, you may end up disappointed. Penny stocks may sometimes be quite hard to buy and sell due to the lack of high trading volume. This makes momentum-based trading strategies not so appropriate. Penny stocks are more suitable for long-term investors. Since they represent small or early-stage businesses that more often than not don’t have the spending power or the resources to innovate quickly, it may take time until their stocks reach certain growth levels. Yet, investing in penny stocks may turn out very profitable in the medium and the long term. Small businesses usually have the potential to explode in value for just a few years, depending on the market conditions, the characteristics of the business environment and the competitive landscape. Think about it that way - a price jump from $1 to $1.5 per share may still mean that the business is far from the top ranks, but in reality, it is a 50% jump in the value of your portfolio. 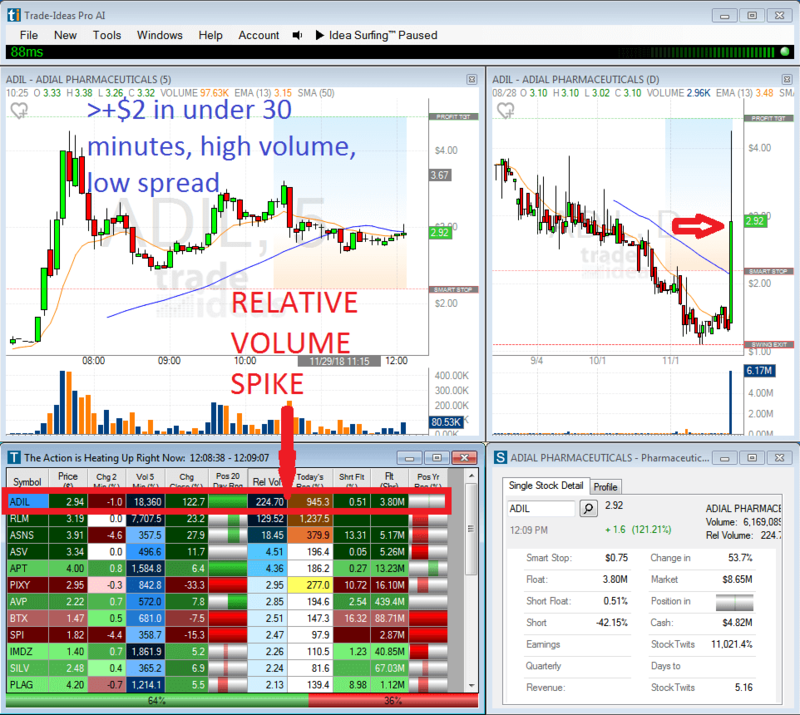 Trade Ideas is the only tool you need to scan for all kinds of penny stocks on any US stock exchange. You can adjust your search based on up to 500 different filters. Price, gap, movement within a specific time and trading volume are just four filters you can use. ​I recommend you to read the revealing Trade Ideas Review first to get a better understanding of Trade Ideas amazing capabilities. The fact that most penny stocks are traded OTC (outside the major exchanges) and quoted on the OTC Bulletin Board, means that you cannot invest in such instruments through each and every broker out there. That is why if you want to trade penny stocks, you should find a discount broker or set up an brokerage account with one of the largest players in the industry as not every intermediary out there offers such services. Yet, brokers like Charles Schwab, Interactive Brokers, E-Trade, TD Ameritrade, etc. provide everything you need to start trading penny stocks. Bear in mind that some of them have account minimums of up to $1 000, which for investors that plan on starting small, may not be the best choice. When it comes to penny stock trading, the fees and the margins are even more important, when compared to blue chips and large-cap stocks. That is why it is a good idea to consider no-trading-fee solutions. The popular trading app, RobinHood, is a good option if you want to avoid fees. The downside here is that the app is linked to exchanges and does not offer OTC instruments, thus providing a limited amount of stocks for trading. If you want to trade only the most popular and exchange-listed penny stocks, then RobinHood may be your best choice. Apart from the businesses that they represent, penny stocks differ from each other in another aspect as well – the price they are trading at. The general rule that each share traded at prices below $5 is a penny stock does not reveal the complete picture. Penny stocks are further differentiated according to their price range. These are usually the ‘’blue chips of penny stocks’’. They are often preferred due to the great upside potential that they have. For example – BoA’s shares were trading at $5 in 2011. Currently, their price is above $27 a share. There are plenty of other examples, but the main idea of this type of stocks is one and the same – they have the capacity to explode in value. Plenty of these penny stocks are listed on the NYSE and NASDAQ. This is a bonus as there will be more liquidity which can help you buy and sell immediately and capitalize on a market momentum. A level below, the shares trading under $1.00 are another suitable investible instrument that can still be found on NYSE or NASDAQ. The majority of these stocks are sold OTC. Most of the shares below $1.00 represent companies at their very early stages or with very small operations and capital. When it comes to growth potential, they are a better investment choice compared to the previous category. Nevertheless, the associated risk is way higher as some of these companies cannot live up to their potential and fail in their early days. As strange as it may sound, in reality, some stocks are trading at prices below 1 cent. They usually represent struggling companies or very-risky ventures. The NYSE, for example, has a policy of delisting companies with a share price below 10 cents. Once delisted, these shares are traded OTC. If we take a look at a free stock listing website we will find out that these penny stocks have the potential to explode with more than 300% in less than a day. Unfortunately, at the same time, they can erase all your portfolio should they enter a downward price spiral. There are thousands of penny stocks trading worldwide. To navigate the process of finding the most appropriate trading instrument, one of the first factors to consider is their trading volume. Penny stocks, as their name suggests, are worth very little. If you have significant exposures to certain low-priced shares and they experience a sudden price drop, you should be able to sell and exit as soon as possible, to minimize your losses. In general, each stock that is traded at below 10 000 shares per day is considered a low-volume one. Most penny stocks fall within this category. The lower the trading volume is, the easier it is for market participants with larger positions at certain stocks to cause a price movement. Imagine that an individual investor has 10 000 shares of the company XYZ and the average trading volume for the given stock is 1 000 per day. If he tries to sell all his assets at once, this will mean a selling pressure that is 10 times higher than the average trading volume which has the potential to further decrease the price. If an individual investor bought 1 000 shares at a price of $5.00 each a few years ago and they are now trading at $7.00, he may want to try selling and capturing the realized gains. However, if the daily trading volume is low (100 – 200 shares a day, for example) it may take him more than a week to sell all his stocks. This prevents the investor from the chance to capture his 40% profit. You can find plenty of websites offering “the ultimate penny stock picking newsletters” or suggestions about the “hottest penny stocks”. Make sure to take all that with a grain of salt. Many times, the authors of such newsletters are owners in certain stocks, themselves. By trying to attract potential investors, they may be seeking to influence the price of a particular instrument for their own interest. To find unbiased recommendations make sure to visit and subscribe for services from leading industry portals, such as Investopedia and their “Penny Stock Research” newsletter, for example. Focus on initial research and track the history of each instrument that you plan to invest in. Please do your homework and find out as much as possible about the management team and whether they rely on issuing stocks to raise capital, what are their long-term plans, how competitive the particular sector is, etc. Bear in mind that some sectors, like the mining and the metals ones, are more common for finding penny stocks. Do not forget that the risk associated with penny stocks is way higher when compared to other similar instruments. Day trading strategies like the gap and go strategy can work out nicely with penny stocks if low trading sizes reflect the high risk. As ​lined out in the article "What is buying on margin," one should avoid using margin when trading penny stocks. Furthermore, the traded volume at the particular day should be high to keep the spread low and the executions favorable for the trader. An excellent way to find stocks that are worth investing in is to use the Trade Ideas stock screener. You can also set up a demo account with some of the brokers, offering penny stock investing just to taste the waters and take advantage of their professional tools. Although often underestimated, penny stocks have the potential to make you a ton of money. If you want to take advantage of the benefits of day trading penny stocks, first of all, make sure to create a risk-adjusted strategy that will help you protect your wealth and achieve your investment goals. If you are struggling to develop your own strategies, use advanced trading tools like Trade-Ideas. Focus on research and choose shares of companies with strong corporate fundamentals. Once you feel confident enough and have figured out which instruments are worth investing in, you can fund your brokerage account and start day trading penny stocks.